The American band Green Day (image credit) is probably the best group emerging from the nineties' neo-punk scene. Good albums like Dookie and Nimrod put the group firmly on the map. Their finest moment came in 2004 with the amazing concept album American Idiot, easily one of the best albums of the century so far, in my opinion. 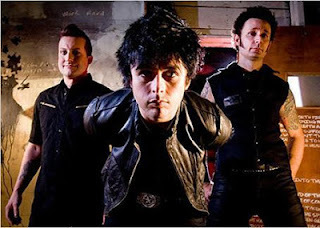 More melodic than their previous work, the raw power is still present as well, which is evident in the hit single Boulevard of broken dreams, but above all in the beautiful ballad Wake me up when September ends, in which lead singer Billie Joe Armstrong tries to come to terms with the death of his father. Other songs by this act that would have qualified: not applicable. covers that are great but not as good as the original will not make the list if the original does not make it (because that act has an even better song). Many of these songs, but not all, will be familiar to many - I strive to include links to YouTube though wherever possible. There will be 2-3 songs posted per week, aiming to finish off the countdown by year end. Reactions can be given on Facebook, where I will post links to these blog entries.